The words stung, because immediately I knew they were true. As you know, my book The Art of Work launches today. If you’ve been waiting for it, you can now buy it on Amazon and get the audiobook for free, plus $250 in bonuses. But after so much effort expended on telling you to pre-order the book, it seems silly to spend one more blog post telling you to buy it. Instead, I’d like to do something different. I’d like to thank all the people who made this, and everything I do, possible. A family. My wife has been incredibly supportive throughout this whole process, cheering me on with each obsessive check of the Amazon rank. And my almost-three-year-old has been quick to remind me that no matter how busy you are, there’s always time for a lightsaber duel. A team. I couldn’t have pulled this off on my own. My team, which consists of a wonderful assistant, bedazzled customer service rep, and incredible project manager, have helped me not lose my mind. Our book launch team members have been early adopters and constant encouragers. And my partners have helped the book reach brand-new audiences. An audience. It doesn’t escape me that the books I write, the stuff I create, and how I make a living is all made possible by people like you who have given me the gift of attention. I try to not take that lightly. We all need people to remind us we are not doomed by our greatest failure or defined by our greatest success. You can only accomplish so much on your own. A race is no fun if you don’t have anyone to meet you at the finish line. In any undertaking, the work you do is only as significant as the people it impacts. And if you’re creating for your own amusement, the enjoyment you get doesn’t come close to the satisfaction of making something and seeing it connect with another human being. For me, there’s something healthy about remembering that wherever I am in life, I did not get here alone. So today, we celebrate. To everyone who pre-ordered the book and made it a success (it’s currently a best-seller on Amazon), this is your day. To those who believed in the message and helped it spread, my hat is off to you. And to the amazing people whose stories are featured in the book, I am forever grateful. When you get a copy of the book, snap a picture of you with it and upload it to Instagram. 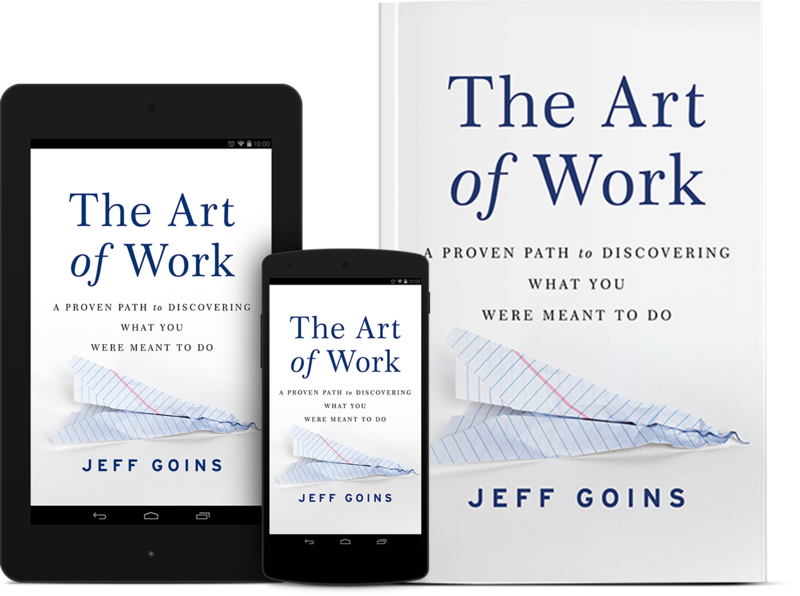 Tag me @JeffGoins and use the hashtag #artofworkbook. We’ll randomly be giving away prizes to those who participate. If you want bonus points, write out a quote from the book and share it as an image (like this). Every day, we’ll pick a winner. Order a copy of the book (paperback or eBook) through any retailer and submit your receipt at the book site, and you’ll get a free copy of the audiobook plus $250 in other launch bonuses. This launch week exclusive expires at 11:59 p.m. on Saturday, Mar. 28, 2015. Register for my online book launch party, where I’ll be sharing more about the book, answering any questions you have, and sharing what it takes to find your calling. And lots of other places. See what extra bonuses you can get when you order the book this week here. Maybe, as simple as it sounds, that’s the answer. How do we catch ourselves in the midst of our own ambition when we’re running too hard or too fast in a certain direction? Just love. Yes, I launched a book today. And if you buy it, that’s awesome. But I want to make one thing clear: none of this would have happened without you. I don’t always know if I’m doing everything right or feel like I’ve got it all figured out. But when I’m surround myself with people who love me and remember to love them back, things tend to work out. There is no better cure for selfishness and no better way to live your life — or, for that matter, launch a book — than to share it with others. Thanks for letting me do that. Of course, I’d love your support with the book launch this week. But I couldn’t pass up a chance to express my gratitude. This day belongs to you as much as it does to me… maybe more. What do you think? Share in the comments something you started that initially felt selfish but eventually became much bigger than you. Feeling the love Jeff! Not once in the past six weeks have I felt that you were being selfish. I only saw someone who is passionate about what they do and knows that they can make a big difference in people’s lives. Enjoy the launch! Love it. It’s the readers and the impact the book will have in the lives of others that matters most. Fuel for the effort and the journey. It’s a marathon vs a sprint. Well said, and thanks for your help, man! Looking forward to getting the hard copy in the mail! I read the PDF version in one day… fantastic! Thanks, Donnie! Wow! High praise right there. Super excited about your launch, Jeff. I’m honored to have been part of your team to help spread the news. And yeah… I totally agree with @declan_wc_wilson:disqus. You did it well and you did it right. Congratulations! Thank you Jeff for allowing me to interview you about your book. It was an honor. Your book is helping me clarify my goals and find my passion. Thanks Jeff. I really appreciate the reminder that this is about us. YOU wrote a great book but you also had a great team. Your success, is at least in some small measure, our success. We rejoice with you! Enjoy this incredible day. You deserve it! Thanks, Randy! Really appreciate you! So I first “discovered” you back in 2011, when you were first getting “noticed”. I left the blogging world and have recently returned, and just in time! First of all, I’m happy to see how much you’ve grown in the past few years…so neat to see how far you’ve come in just a few years! Second, your book seems to be just what I need in this season of my life as I’m trying to figure out my life. 🙂 I look forward to reading. My blog is new and I only have a few posts up (and no audience, lol!) But I’ll be happy to share a review whenever I get done reading. I mentioned a little blurb about it today. 🙂 Blessings to you and your family. Thanks, Kimberly! I appreciate you sticking around for the long haul. I hope the book helps you a ton! Jeff, I think you’ve been exceptionally generous. Not just with all the extras, but with taking the time to write The Art of Work in the first place. By sharing the stories of others and compiling them into a message of positive self discovery. Congratulations on your well earned success! Great post, Jeff. So excited for you, and I appreciate your continued process of being generous and humble and helping others live into who they were created to be. Just received my copy in the mail today! I’ve already started reading, and I can’t put it down. Also – this has to be the best launch day post I’ve ever seen. Way to keep things genuine! Something I started that was initially selfish and became about so much more than me: My sister and I started a podcast last June, and selfishly, we really just wanted to pick the brains of other mom entrepreneurs, take their advice, and implement it. We hadn’t thought much beyond that! Our audience pushed for a private Facebook group that has, no joke, changed our lives. We are great friends with so many talented, smart, incredible women because of this group. They teach us more than we could ever teach them. They help, encourage, and make us laugh. The podcast is not just a podcast anymore – it’s become this living, breathing thing all its own. It honestly feels like we don’t really own our website/podcast/brand, our audience does. It’s theirs. Big congratulations Jeff! I’m deep in the PDF and enjoying its spirit, and very much looking forward to finishing up on the luscious print version. You were generous with the early launch offer, and even more generous in the emotional investment and depth of the work. Good stuff! Maybe like air travel Jeff? Lots of needed instruction and communication at the on-set of the launch from the team, but then when you hit full speed, less energy is needed. Congrats! Selfish book launch? Perhaps, but I think it depends upon the book and its purpose. My books in progress are all self-help. Two out of three I’ll be giving away for at least 90 days. It is my aim to help people. The money will come when and if it should, imo. Best wishes and I can’t wait to get the print version. I loved the pdf, but I’m old school and love holding a book in my hands. Congratulations Jeff. Great book which will resonate with many. I’m very excited for you. I enjoyed being a part of your launch group — so much to celebrate! Congratulations!! Congrats Jeff on a great launch, it’s exciting to be a part of it all and consider us over here throwing confetti! Actually I’m the one with my finger on the trigger of the confetti gun! And if that’s not enough, thank you for inspiring us to find our own stories to own! Your awareness of others, Jeff, and your willingness to create community, to invite involvement, qualities that I love about you and admire greatly. Not many people are willing to help others as much as you are or bring their loaves and fishes so faithfully to the crowd to feed. You encourage me, inspire me, and make a way for me to go forward. Yes, the launch might seem selfish but really it just is focused, attentive and inclusive. Thank you for letting us all be a part of this. I am grateful for every bit of it. And for you. My friend posted a beautiful picture with words I asked her to translate. It said “Happiness does not bring you gratitude, gratitude brings you happiness”. Yes, I said. I had no idea that starting a blog would do more than just give me writing practice. I am buoyed daily by the amazing connections I have made consequently. Community is built with kindness and sincerity. Congratulations for your success Jeff and I’m watching my mailbow like a hawk. In honor of your dictionary-loving mother, selfish as defined by Merriam-Webster is “having or showing concern only for yourself and not for the needs or feelings of other people.” That does not square in any way with your book launch. Your self-promotion, on the other hand, is a necessary part of the process. Providing for your family happens to benefit your audience as well – an enviable and wonderful way to make a living. Keep it up! Hi Jeff, I was just listening to your interview with Jonathan Fields on The Good Life Project, specifically the discussion you guys were having about, what Jonathan called a “solitary purpose”. I just wanted to chime-in and offer my perspective. My perspective is that all human beings have the same Purpose in life. However, our Missions are different. And what makes everyone unique is in the way we accomplish our Mission in life. Therefore our duty in life is to accomplish both our Purpose AND our Mission. I have spent many years thinking about this and I offer 4 key questions to help you accomplish your Purpose and find your Mission. If this resonates with you then please consider reading my full thoughts. I pre-oredered book but can’t find receipt # to claim audio book today. Would love to listen as well as read. I’m on chapter 4 via iBooks and can’t wait to hold the real book in my hands. Great job, Jeff. This book deserves to be a best seller. Hi Carol. Thanks for your kind words. You can just use your zip code, if you can. Thanks!